Team USA is into the men’s curling gold medal match as a result of another stunning upset early Thursday over Canada. You are quite possibly swelling with national and state pride, a symptom of the curling fever that afflicts even the best of us once every four years. If your knowledge falls somewhere between “what is curling?” and “that eighth stone came in heavy, don’t you think?” here are some things to hopefully get you caught up and ready for a late one Friday night/Saturday morning. *OK, so can you tell me about the curling basics? Sure! In the case of the men’s final between the U.S. and Sweden, each team will have four members. The leader of each team is called the skip. Each team of four throws eight stones (the roughly 40-pound rock that slides down the ice) per end — akin to an inning in baseball — alternating shots between teams. There are 10 ends in a match. The object is to get as many of your stones as possible into the circular scoring area, called the house. For each stone at the conclusion of and end that is closer to the center than any opponent stone, a team gets one point. Being the last team to throw is a big advantage, called the hammer. The team that did not score in the previous end gets the hammer in the next end. The team with the most points at the conclusion of 10 ends wins. *How did we get here? Well, some say it’s just a big cosmic accident while others … wait, no. How did the U.S. get into the gold medal match? It was not easy. In fact, it’s one of the best upset/redemption stories in recent memory. 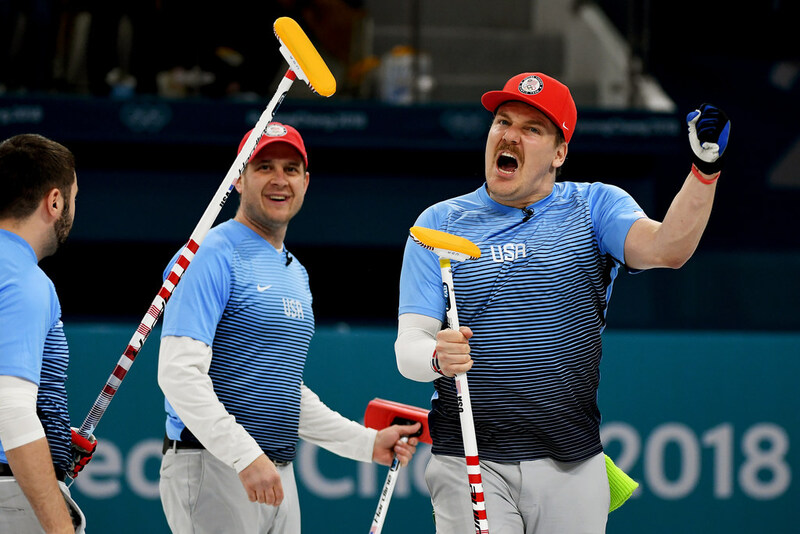 John Shuster, Team USA’s skip and a native of Chisholm, was on the bronze medal-winning USA team in 2006 but had two rocky Olympic experiences in 2010 and 2014 that ended well short of medals. It looked like more of the same early on in Pyeongchang, as the U.S. fell to 2-4 through the first six matches of the tournament. But the Americans won their next three matches — including their first-ever win over Canada in the Olympics — to improbably reach Thursday’s semifinals. In a rematch with Canada, the U.S. again prevailed with a calm 5-3 victory. *Is curling exciting? I guess that’s up to you to decide. It doesn’t inherently sound exciting to watch competitors slide giant rocks down the ice, while teammates frantically sweep the ice to clear a path, but it is oddly mesmerizing. At its best, it’s a little like watching a high-stakes golf tournament. The drama is in the tension and the thin margin for error. *How can I watch the gold medal match? Here’s where it gets a little tricky. I’ll be on the lookout for watch parties, but the match vs. Sweden is slated to start at 12:35 a.m. Saturday, and it will end long after traditional 2 a.m. bar close time. Some local curling clubs might have viewing parties, but those might be members-only. Your best bet might be to host your own party for the final, which will be shown live on the NBC Sports Network. The match will last somewhere between 2.5 to 3 hours, so don’t expect it to end before 3 a.m. If you’re in for the long haul, put on a pot of coffee. Or grab some energy drinks. Mix in some vodka if that’s your thing. I’m not your dad.